Over the weekend, six photographs showing mounds of garbage left on Slaughterhouse Island, a popular party spot at Shasta-Trinity National Forest in Northern California, were posted to Facebook. “Here is what a group of University of Oregon students left (they are gone) on Slaughterhouse Island on Lake Shasta,” Jennifer Vick Cox captioned the photoset. “Way to represent your school...” she added. The photographs show everything from discarded tents to sleeping bags, University of Oregon emblazoned flip flops and bags, plastic chairs, as well as garbage of the Greek variety: plastic cups with paint-penned letters and coolers with fraternity colors and letters. It’s the special kind of frat party garbage, monogrammed garbage that probably reeks of Natty Light, the kind that puts a fraternity’s indelible marker on the earth, proclaiming the presence of brothers interesting enough to write, “Do you wanna do some blow man?” on a cooler. The cooler, as well as other objects, had the letters of the University of Oregon’s Lambda Chi Alpha’s fraternity painted on them. Willamette Week reports that parties in the area are common and trips to the lake are an annual event for fraternities and sororities on the West Coast. Phyllis Swanson, a spokesperson for Shasta-Trinity National Forest, told Willamette Week that she estimates around 1,000 people were on Slaughterhouse Island over the weekend, with “60 houseboats plus some patio boats.” Trash isn’t particularly unusual after a “Shasta weekend,” but Swanson said the amount left behind this time was striking. By Sunday, the park had picked up 10 yards of garbage and still had more to clean up. Videos from local news stations show park rangers loading the garbage into a special military boat in order to haul it away. The manner in which the Shasta-Trinity forest area was left is disgraceful. Trips to this area have become an annual event for fraternities and sororities all along the West Coast. It is one the University of Oregon does not sponsor or condone in any way. The university is actively investigating the situation and will take action as appropriate. We are working with authorities to learn all we can and determine who is responsible. One national fraternity organization, Lambda Chi Alpha, has taken the commendable step of suspending all of its UO chapter’s activities until the situation is addressed. We hope other national organizations will follow their lead. The Lambda Chi Alpha Fraternity is guided by seven core values: Loyalty, Duty, Respect, Service & Stewardship, Honor, Integrity, and Personal Courage. Unfortunately, the individuals who committed the destruction to Lake Shasta recently seen on social media did not uphold these values. We are partnering with the University of Oregon, and the International Headquarters of the Lambda Chi Alpha Fraternity, to investigate this situation. We will, in no uncertain terms, hold the individuals who did this accountable. Until the investigation into this matter is complete, and all disciplinary actions have been implemented, effective immediately there will be no Chapter activities of any kind. We are taking this seriously and are working to come through this showing our alumni, our university, and our community exactly what it means to be a Lambda Chi Alpha Brother. As for the rangers at Lake Shasta, they continue to clean up the mess left behind. 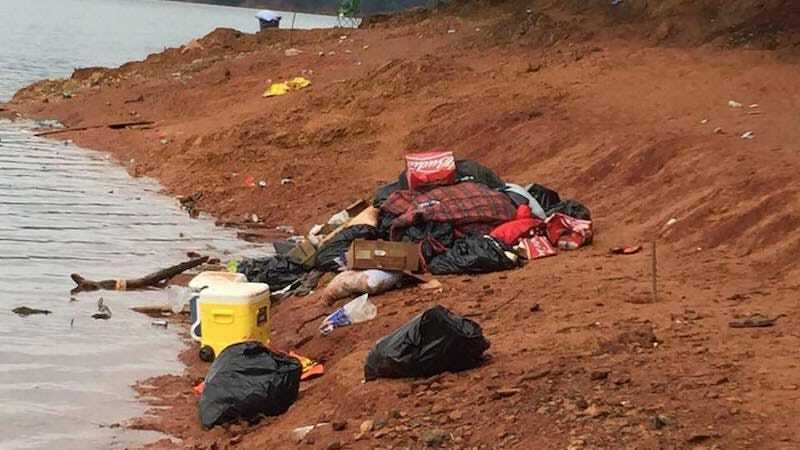 Swanson said that, in addition to the spot documented on social media, the rangers found another garbage-strewn site on Monday. She also said that law enforcement was involved (dumping in state parks is illegal) but it’s unlikely that arrests will be made. The park hopes to have the area cleaned and ready for Memorial Day. No word on whether or not Lambda Chi Alpha, or the other houses involved, will pay for clean up and damages. Images via Facebook/Jennifer Vick Cox.